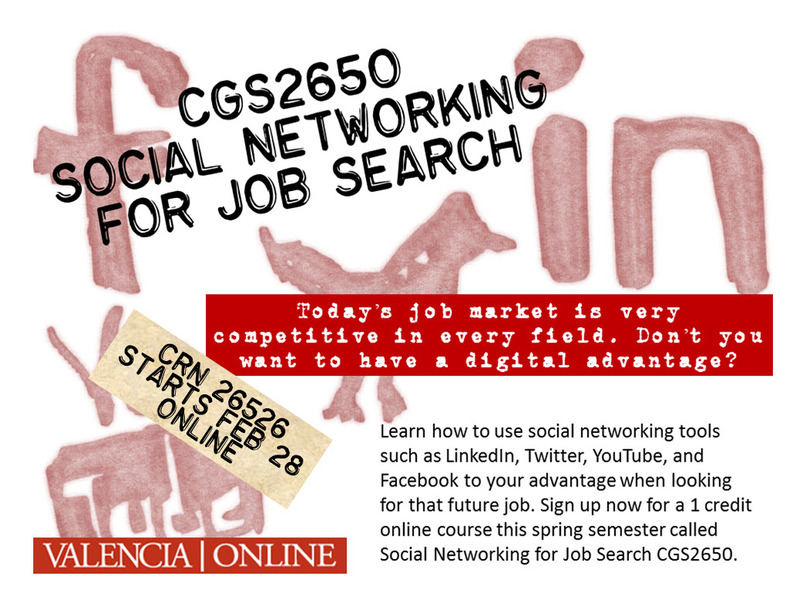 I’m currently developing a new course at Valencia College called Social Networking for Job Search (CGS2650). It’s starting on February 28, 2013 but I still have lots to create for this online course to make this a very useful and exciting course for my students. This online one credit course will focus on various social media platforms that can help students become more connected and present themselves better for future employers. I wanted to blog about my experience in developing this course and teaching this course for the first time. Hopefully you will follow along my journey. As an instructional designer, I’m always thinking of different way to engage students and present engaging content that will make an impact and be applicable to the real world. As I started to think of different way to engage and excite students, an idea popped into my head. Why don’t I conduct virtual interviews with various experts that have used social media to get hired, who are hiring or recruiting people with social media, or have some great advice for students. Typically, most faculty would be able to schedule guest speakers to join them into their classroom but I have a virtual classroom. I wanted to get the most out of these interviews, so I decided to record them in advance online. This will allow me to utilize them over and over for various classes without having to ask someone to always come back to talk to my students every semester or for multiple sections. Now I had to figure out the best way to record them. I went with my gut and experience, that Google+ Hangouts would be one of the best tools for the virtual interviews. I would utilize Camtasia to record both the video and audio on the screen and make slight edits after the interview. I would be able to upload these easily to YouTube and have them saved as unlisted to share easily across platforms or learning management systems. I used a tool called Doodle to help schedule various times that would work best for the various individuals. Doodle is a whole other blog posting but essentials it helps you find meeting times easily among a group of people. Here is my first interview with Jeremy Hilton (@jeremyhilton ) from Side Door Social. Listen closely, you might get some great advice too! I have 4 interviews already recorded and a number of others scheduled coming up. I can’t wait to hear what students think about them. Have you used virtual guest speakers in your online course? Next post I’ll focus on the various types of assignments in this course to engage, excite, and educate students. Like the interview format! But I think you need to put some stuff on those walls, lol.